In our last exciting episode we visited Trantor, or at least a city world that could pass for Trantor, an ecumenopolis of a trillion people for whom the Galactic Empire is something of an afterthought. But having come this far we ought to see more of it than just the inside of a spaceport gate or elevator foyer. The Foundation 'verse has no teleportation tech (if you exclude jump-style hyperspace), so to get anywhere on a planet you have to go there. And if our ecumenopolis is a real city - not a mere planetwide suburbia (how boring!) - this means a public transit network. Cars will not do, not for general use - not even Futuristic[TM] skimmer cars or whatever. Not even robocabs, which did not exist in that 'verse anyway. It is all about geometry. Cars and highways are fine at low population density, such as tract-home suburbs - say, 5000 people per square mile = 2000/km2. But once you get up even to townhouse urban density, about 10,000/mi2 = 4000/km2, parking and roadway space become a major hassle. Putting everyone in robocabs instead of private cars would help with parking, and the robo part would allow more roadway crowding before gridlock sets in. (Robots should drive better than we do.) Boxy little cars would help a bit, too. But these measures only get you so far. Yes, in principle you could have multiple layers of parking garages and underground roadways below the dwellings. And since Asimov's 'verse did have aircars, you could move the garages to the top floors and the traffic jams into the air. In the Future, car accidents never happen. But in practice, at some point it gets easier and faster to simply take the bus. Which brings us to transit technology. In rocketpunk days it was taken for granted that even ground vehicle would never use anything so primitive as wheels. As late as c. 1990, the agency building the Los Angeles rail transit lines insisted that artists' conceptions avoid showing that its trains would run on (gasp!) railroad tracks. Now, of course, tracks are back, including streetcars (trams, to some of you). Depending on the state of the tracks or pavement, streetcars usually have a smoother ride than buses, but don't go any faster. Their chief virtue is that a streetcar, running on rails, can be longer than a bus and thus carry more people. But this only really matters for very busy lines, which is why most streetcars vanished around the rocketpunk era. * In any case, by the near future - no need to wait for the plausible midfuture, let alone the Galactic Era - technology could blur these distinctions. Much loved in the abstract, monorails never became popular in real life because people hate els running above their street. This is too bad, because you see a lot more of the city from an el than you do from a subway. But most people hate on els anyway, and still hate them even when the tracks are narrower and don't blot out quite as much sun. Which is why monorails remain rare. The other great rocketpunk transit tech was the slidewalk, a pedestrian conveyor belt resembling a flattened out escalator. Step on and be carried along. These are more interesting, as a real departure from conventional vehicular transit. For one thing, slidewalks run continually, so unlike a bus or train you don't have to wait for it. This is a big deal, because people hate waiting, and long wait times can effectively wipe out the advantage of high speed. Like monorails, some slidewalks actually exist, but also like monorails they have never really caught on. The problem is that if they are fast enough to save you much time over walking, people will stumble and fall all over when getting on or off. Heinlein (and probably others) suggested multiple side-by-side strips, so you could start on a slow 'local' strip, then cross over to faster express lanes. Alas, unless Trantor has UBT - universal ballet training - this side-step across a speed differential is also a guaranteed pratfall generator. With suitable magitech you might improve on the situation. Clarke's far future city of Diaspar has slidewalks made of flowing 'anisotropic matter'** that you can stand/walk on, while allowing a smooth transition from slow edges to the faster center express section. Slidewalks are still limited in speed unless your magitech also moves the ambient air along so riders aren't facing a gale-force relative wind. Rapid transit they are not, but if you can solve the pratfall problem they might have a place along busy corridors like Seldon Street. Indeed, for window shoppers and flaneurs, Seldon Street might even have slidewalk cafes and such. But this is more tourist attraction urban amenity than practical transit for people who just want to get where they're going. Otherwise your basic local line, the service that goes everywhere and stops at your corner, is essentially a plain old bus. Even though the smelly diesel bus has surely gone the way of the 19th century horsecar, which also emitted a noxious exhaust. And so a bus it is, though heavy Trantorian ridership levels - especially along busy Seldon Street - might justify streetcars/trams. We will also suppose that heavy ridership allows TERTA to provide frequent service, so you only have a short wait when connecting between lines. But the local bus can't be very rapid, not for techological reasons as such, but because it has to fight its way through traffic, automotive or pedestrian. Even if separated from other traffic, it must stop every few blocks to let riders on and off. And it can't get up too much speed between stops because of a basic human limit. Back in the 1930s, the R&D program for the classic American PCC streetcar determined that the highest comfortable acceleration for transit straphangers is about 0.2 g, or two meters/second^2. The maximum acceleration of the PCC was thus set close to this level - quaintly expressed as 4.75 mphps (miles per hour per second). For surface vehicles that 'push against' the road or track, power needed for a given acceleration rises with the square of velocity; to avoid wasteful design, average acceleration for all but the most local service will be about half the maximum, a nice even one meter/second^2 or 0.1 g.
Absent magitech pseudo-gravity to allow high acceleration without bowling passengers over, technology cannot dramatically change these constraints, which is why present-day transit lines are not much faster than those of 100 years ago. Between the acceleration limit and the need for frequent stops (with 'dwell time' for riders getting on or off), the average or service speed of local transit is limited to about 15 mph / 25 kmh or thereabouts. Fighting through traffic makes it a good deal slower, unless the the line runs on its own reserved speedway in a boulevard median - an arrangement both useful and rather elegant. To get around this practical speed limit, large present-day cities have a two-level transit heirarchy. The local bus runs everywhere. 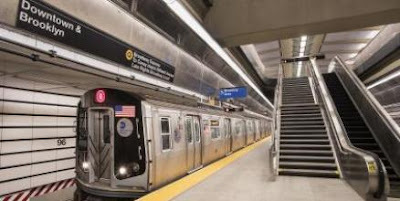 Layered above it - or more often below it, in a subway - is a rapid transit or metro system, unimpeded by other traffic, with lines and stations more widely spaced, typically in the range of a kilometer to a mile apart. Because the rapid transit trunk lines have heavy ridership they are commonly served by multi-car trains, not individual buses. So we will simply call the rapid transit vehicles trains, without further ado. Longer runs between stations allow higher top speed for the same acceleration, and rapid transit service speeds are in the range of 25 mph / 40 kmh. A two layer transit hierarchy is enough for most present day cities. Paris has a third, the RER, and London is developing one, the London Overground, upgrading and connecting suburban commuter lines for frequent all day service. This heirarchy is not rigid - 'light rail' and 'bus rapid transit' both tend to be intermediate or hybrid cases - but it provides a starting point for discussion. And as commenters on the last post already anticipated, Trantor will need multiple layers in its transit heirarchy. Just how many is hard to say; we don't have even semi-ecumenopolitan examples to guide us. Travel time is about 300 seconds, five minutes, and the vehicle goes 22.5 km. If we let the train cruise at top speed for another 150 seconds, we go 45 km in seven and a half minutes. An express run, passing intermediate stations, can go nearly 160 km - 100 miles - in 20 minutes. For comparison, the fastest existing transit line, the Shanghai airport maglev, runs 30.5 km in 7:20, hitting a top speed of 120 m/s. So the model performance is only modestly above current rail practice. These high speed lines can form the third layer of the rapid transit hierarchy. Below them, heirarchically, are regional trains that stop every few miles or km, then the primary metro subway (and finally the local bus). Allowing time to get from your home to the high speed rail station, and from the destination station to wherever you're actually going, this type of system - local bus plus a 3-layer hierarchy of rapid transit, will get you pretty much anywhere in the extended neighborhood within an hour, where the extended neighborhood extends a hundred miles or so. At typically modest Trantorian urban density, up to half a billion people live within this radius (fewer if there are geographical constraints like a coastline, large park, or the Imperial Palace grounds.) So within an hour's ride are a corresponding number and variety of jobs, restaurants, potential lovers, and whatever else the city has to offer. But to really get around town we need to go faster. Suppose now a one hour 'semi brachistochrone' - 20 minutes accelerating at 0.1 g, 20 minutes cruise, 20 minutes decelerating. This takes you nearly 2900 km, 1800 miles, about the length of Seldon Street. Top speed is 1.2 km/s: rapid transit, indeed! The currently popular technology for this type of service is a hyperloop. Unfortunately, in current proposals the accent is on hype - not because the tech is modestly speculative, but because promoters tend to shamelessly lo-ball things that are not speculative at all, such as the cost of building elevated viaducts. But all that said, some such technology should be viable - essentially a genteel cousin of a mass driver or coilgun - and TERTA knows how to estimate construction costs. With a nod to London, the Mother of Rapid Transit, I will simply call these Tube lines. For the longest trips, a two hour nonstop Tube takes you up to 11,500 km / 7000 miles, nearly a third of the way around an Earth sized planet. Allowing for all connections and wait times, you can get from most locations on Trantor to most other locations in perhaps five or six hours. A 'local' Tube running 30 minutes between stops will go a quarter as far as the baseline model, around 700 km / 400 miles. This service thus runs the length of Seldon Street in two hours, with three intermediate stations. Conventional high speed express trains connect these stations in turn, with another four or so intermediate stops, and so on down the hierarchy to the primary rapid transit that stops every mile or less. Then there are the buses and streetcars, and perhaps slidewalks, along Seldon Street itself. Thus a two hour trip - about the maximum for casual daily travel, whether commuting to work or meeting a friend for lunch - will get you more or less anywhere within a thousand km / 600 miles. If your destination lies close to a major transit hub you can go two or three times as far, because it will be served by top level lines, and you won't need to work your way back down the hierarchy. The cityscape will reflect the granulation and heirarchy of the transit system. Most rapid transit stations will be nuclei of urban villages, neighborhood centers for errands, entertainment, and general public social life. Major stations will draw larger and denser condensations of the world city, some perhaps on a scale that would match our grandest Zeerust visions of the urban Future. And while Trantor falls short of being a single practical commute zone, something in the range of 10-50 billion people probably live within two hours of wherever you are. Long distance travel might be constrained by high fares, but perhaps TERTA runs like the semilegendary subway of Gotham on the Origin World: a nickel takes you all over town. Although not part of the urban transit system, a word about space elevators. I have argued that they are only suited to truly enormous volumes of space traffic. Well, here we are: If any world has the requirement, Trantor does. We can imagine numerous elevator lines rising from the equator, probably with ring lines connecting them at geosynch level. Commenter Eth noted last post that the elevator cables could also support a ring of solar collectors or radiators if needed for power or heat management. Enough about the elevators; back to TERTA. The system is extensive, with bus and rail lines totalling hundreds of millions of miles, served by up to a couple of billion buses and subway cars. The Tube network, serving only long haul trunk routes is a mere million miles or so, interconnecting perhaps a thousand stations - few enough that dedicated enthusiasts will have visited all of them. These major stations should be suitably impressive. The levels of the transit hierarchy must become literal here, the long-haul Tube lines probably running deepest, with local lines being closer to the concourse and street entries. As with major airports today, a transit system might be needed simply to get around the station itself. And at times it will seem as if all those trillion Trantorians are trying to catch the same train that you are. But from suitable locations you can look down along some of the lines, with their diverging and converging switching networks and crossovers. The utter coolness of which is justification enough for this visit to Trantor. * The Great Streetcar Conspiracy was real, but played only a minor role in their demise. Streetcars were unfashionable in the 1950s, and most systems were old and badly run down. So it was simpler to bus convert even the few lines busy enough that streetcar modernization would have been preferable. ** Anisotropic matter is also a term in relativity and cosmology, but I have no idea how it relates to the stuff you would use for slidewalks. The image of the Second Avenue Subway comes from the New York City transit agency. Because even tiny villages like NYC can benefit from rapid transit! 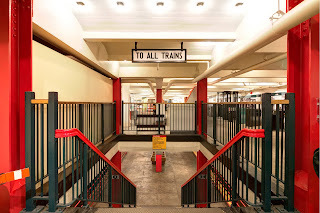 The eastside Manhattan line, first proposed about a hundred years ago, opened on New Year's Day, and cost about $5 billion for a couple of miles of line - outrageously expensive even for subway lines, which are never cheap. But even at train robbery prices it will be worth the wait for the good citizens of Gotham. And as a curious example of Google time lag, there are not yet any good post-opening images of the line, which explains the odd absence of New Yorkers on the station platform. 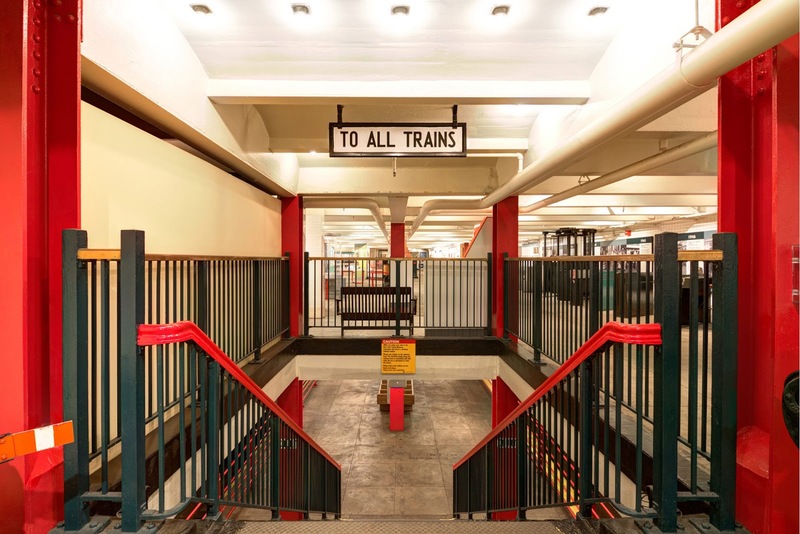 "To All Trains" is from the NY Transit Museum. I've read that US streetcars were also killed off by an act of Congress, forbidding power companies to run streetcars, despite the synergy of owning the power lines. And streetcars and light rail did survive somewhat better in e.g. Amsterdam and Canada. Canadian transit in general is much higher than in the US, despite also being a big spread-out country, so politics is a real factor here. The 1950s also saw the GI bill and interstate highway programs, subsidizing suburban living in the US. Buses and streetcars share the problem of running slower than traffic: they're in traffic, then also have to make stops. Anyone who can drive will get to their destination faster than by taking those modes of transit, even if the decision of everyone to drive causes the congestion that slows the streetcars and buses down. (Tragedy of the commons: streetcars without cars would often move faster than mass use of cars.) If Trantor limits independent vehicles to delivery (pneumatic tube comeback?) and emergency or high-price uses, the streets will be clearer. Though it's still valuable to separate high speed modes from squishy pedestrians, as metro systems do. NYC has a 'third level' of its own: express lines running in parallel to local subway (or el) service, which much more spaced out stops. I haven't looked at schedules to see how fast they ideally run. This setup also makes 24/7 service easier, since local-only night trains can be shuffled to one track while the other gets maintained. In the Bay Area, BART stops in SF provide a third level to SF Muni's subway/streetcars and bus network, while being more like a rapid/commuter hybrid outside the city. Manhattan, Paris, and Hong Kong Island (26k, 22k, 16k people/km2) are probably the closest real world models for Trantor density, so looking at their transits would be useful. None is all that big on their own, Paris is biggest at 2.2 million people. Which might be suggestive: what would it take for all of NYC to be at Paris density, which would roughly double the population to 16 million? Asimov had parallel slidewalks for speed, with covered high-speed ones in the center, in _The Caves of Steel_, but I guess Heinlein's "The Roads Must Roll" came first. The earliest example of those mass transit sidewalks I am aware of is from ´The Sleeper awakes' from H. G. Wells. Which I recommend to any fan of early SF, btw. Unfortunately, it does seem impractical. The sidewalks I experienced (in metro/RER transfers mostly) work because they are separated from immobile zones, and you take them by stepping on it at one end (and get out at the other). Side transfer is impossible, and would probably be simply too dangerous. With this arrangement, it is probably impractical to have multiple speed bands. Still, they do have niche uses, to accelerate walk along a short, specific section. Those I have seen double walking speed, or move immobile people at walking pace, for about 100m. There might not be that many express trains going at high speeds over long distances, aside from one or two daily. If the city-planet of the future is heavily services-economy oriented and full of automation (like where we are heading), then most mega-city-sized areas are going to have the overwhelming majority of the regular services and goods that people need within a reasonable commute. The exceptions would be like today, where you don't routinely ride a train a thousand kilometers if you're an average person. It wouldn't be so much a "world city" as just wall-to-wall cities. However, there would be a considerable amount of automated trains carrying processed goods, raw materials, and non-recyclable waste around the ecumenopolis. And of course you would have some economic cluster areas, and possibly a set of express trains in a hub-and-spoke pattern from the Imperial Palace and HQ to bring in a large amount of people especially quickly. Two things: One; pnumatic tubes for people transfer (like on"Futurama), are probably a bad idea. Two; dedicatedexpress lanes/tubes/roads/air corridors for emergency services are good. Air traffic most likely will be just for official use only, however, I do see the need for roads, tunnels, etc just for fire/police/rescue and the like. Even if they are only used once a week, on average, then they are worth incorporating into the web of traffic and transport. And writing this, I realize that visulizing it as a 3D web instead of a flat fabric-like structure might be better. Is there any need for hyperfast intercontinental services? The fastest commercial airplanes have gone so far was Mach 2, ~660m/s, and that turned out to not be economically viable. Given that at even fairly regular current megacity densities (such as London at ~6000/km^2) you'll have a ~billion people within a couple of hours conventional (100mph) rail, I'm not sure we'd need an ultraloop layer of transit. Without rain, also, you might be able to lose the top layer of transit, the bus. Why would people take the bus when they can walk at 3mph, or cycle/take a pod at 10mph? That leaves you with three layers - metro, for getting around your local borough of 10 million people; conventional rail, for travel between boroughs; and an intercontinental hyperloop system that takes a couple of days to circumnavigate the globe. Enough to get you to anywhere else in the world in under 30 hours. Also, as has been pointed out, a dedicated system for emergency services. But I don't think they'll need anything more than a metro system - an ambulance isn't going to be dispatched from 50 miles away. Along with this, important officials can use air travel. I doubt Trantor would need hyper-fast intercontinental trains, at the very least. Anything truly urgent would either involve high-speed (possibly supersonic or suborbital) air transit, or the people in question would be living relatively close to the Imperial HQ complex to begin with. The rest of the population could either pay for air travel and a few hours flight, or take a longer but cheaper train trip for any distances over 1000 kilometers away. As I said in my earlier post, the overwhelming majority of goods and services will probably be within relatively close transit distance of people on such a planet ("close" meaning "within a few hundred kilometers"). Well, given the dangers imposed by air travel, and the fact that we're talking about a population two orders of magnitude above present day Terra... a small fraction of people who want to travel across the world is a very large number. I think some sort of ground transport system - which could be sleeper hyperloops at 400+ mph - is going to be required. Though perhaps a lot of people would take the less expensive week-long rides in the cargo trains. Which reminds me of another issue. How should the lines be laid out? A simple square grid pattern, with trains running along every line, means you have to travel no more than sqrt(2) times the direct distance between stations to get from any one station to another. A radial system perhaps makes more sense for cities (Trantorian boroughs), with multiple circular lines intersecting spoke lines, so you'll have to change no more than twice to get to another station. I don't know what a triangular grid would be like - perhaps quicker than a simple square grid? In the solar system setting that I occasionally start stories in, I have Luna being a (young) city planet, the cultural hub of the solar system (the political hub, the base of the Terran Commonwealth, is a large station in EML1). I think the nature of Luna will force colonisation to be urban in nature, whilst a partially terraformed Mars (~100mb CO2 atmosphere) could be colonised by settlers looking to set up their own small towns and homesteads. On American streetcars, the political and cultural climate was against them. They were old enough to be clanky and rattly, but not yet old enough to be retro cool. In my fantasy city of Santa Teresa, in the early 60s, a PCC car has a stylized atom painted around its headlight, and is lettered NUCLEAR POWERED VEHICLE. It is the sort of thing that might have happened, but on the whole, it is hard to imagine a less rocketpunk vehicle than a streetcar. Yes, express subway trains in NYC form something of a third layer. I don't know of any other metro system with anything close to comparable express service. On Trantorian long distance ridership, Cererean for the win! On a world of a trillion people, traffic adds up. Suppose that the average Trantorian takes just one long distance trip in a hundred year lifetime. That means 10 billion annual long distance travelers. If half are making a round trip, 15 billion annual trips or about 50 million per day. If there are a thousand long distance station, the average station thus serves about 50,000 daily outbound passengers (and as many inbound). Suppose the network is a grid; you typically can take a train north, east, south, or west. If each train carries 500 passengers, the long distance traffic requires an hourly train, on average, on each line. At this level of traffic, TERTA could just schedule long distance express trains along the conventional high speed lines, averaging some 300 mph = 500 km/h. That will get you to most of the planet in a day. But if Trantorians on average make a long distance trip every decade or so, that increases traffic tenfold, and trains are running on each line every 6 minutes. At that traffic level, you need dedicated tracks for the long haul service. Whether you build it for super high speed is a separate matter. Probably once you get much past half the speed of sound you need to run in a depressurized tunnel, a huge expense and operational hassle. But if you have an ecumenopolis, you might decide that it is worth it. And if TERTA can run trains faster, it needs fewer of them to provide service. On Brett's point, for most Trantorians the experience of daily life would be living in an 'endless' urban fabric. Nearby are places you go all the time, somewhat more distant ones you visit occasionally. Famous places you've heard about even if you've never been there, but most of the world city is just a distant blur. That said, I don't think it would be especially bewildering or easy to get lost. At least not for Trantorians who know the overall geography of boroughs, and how it granulates down to districts and ultimately individual neighborhoods. I also avoided touching on some transit relevant questions like whether they have commuting or some equivalent, so that the capacity of the transit system has to be designed to handle peak hour traffic, not just 'average' traffic levels. Perhaps the vast majority of Trantorians live in basement apartments playing virtual reality games, and hardly ever go out, in which robocabs might be sufficient, and the vast ancient transit system goes unused. But if they leave socially active lives, ridership levels would be high even if the hourly rhythm of urban life is different from what we're accustomed. That makes sense. Most people go to places to work or play that are close to home; no more than hour or so one way. They might go catch a show or visit a client once a month that takes about a half day of train riding to get there. Maybe a few times a year to go to somewhere special that might take a couple of days travel; a vacation or corporate retreat, or maybe an industry wide convention. That would be most people; there are some who travel for a living, or as a hobby (or incidental to a carrer/hobby) so they would travel nearly every day. Even if only a tiny fraction of the total population did that, it would still be a massive number. I can forsee letting the trains get off scedule might be an Empire-level crime worthy of capital punishment. I'm going to avoid dumping a bunch of my own opinions here, & merely observe that the solution for slidewalks is well-known : a disc, tangent to the slidewalk & rotating with velocity chosen to match the linear velocity of the slidewalk at the outer circumference. This disc, in turn, is best accessed via something like an escalator, which puts you off at a radius where the disc surface is receding from you at the same velocity as the escalator step is carrying you forward. Transfers from one velocity belt to another, or between belts running in different directions, are done in the same basic manner. That was covered in "Popular Science", I think in the 1940s, when it was seriously proposed to connect Grand Central & Penn Stations in New York City by a transit belt. Glad you're back, Rick You were greatly missed. Nice to see you back again. Hope everything is well with you. WRT the topic, one thing you did not mention is "three dimensionality" in rapid transit. If everyone is living in high density accommodations, then there would be need to get people and things not only across the neighbourhood, but also up to your apartment on the 10th (1000th?) floor. The other issue that needs to be addressed is people in general *hate* public transit, and avoid it if at all possible. Getting into a crowded bus/streetcar/subway with random stranger, having to conform to the schedule of the transit service rather than your own whims and generally *not* being able to get door to door service are the major factors that deter people from using transit, even in places where transit would be obviously much more efficient. (This is without the issues of class and social standing that go with public transit usage). Personal transit in individual pods has been touted as a way to overcome some of the issues with conventional transit, but few of these systems have ever been built, and a cursory reading of the literature suggests than none have ever come close to being profitable. The only place I can think of where these issues have been tackled in any halfway sensible form is the movie "Minority Report", where individual transit pods were configured to both run down the highways, and also climb up and down the vertical walls of buildings, delivering people to and from their balconies. The "how" was hand waved away, but this is really the sort of thing people would go for in such a society. Taking the concept further, the pod could drive into lanes or tunnels marked local or bypass and accelerate to the speeds listed in the three layer model, preventing the change of station that people also find annoying and providing true "point to point" transportation. Thucydides, you are from America, I presume? From what I gather, Americans are quite weird when it comes to public transportation, and very much in love with their cars. That wouldn't necessarily be the case with an ecumenopolis. A Trantor populated by the Japanese, for example, would be very different from one populated by Standard Americans. And different still for Non-Standard Americans. Most large American cities that have efficent mass transit, that attitude is less previlent, but you are right that people adjust to their enviornment; especially the one they've grown up in. Travel pods, that can link up and form pod trains, might be added to the mix. They couple to an external guide on a building wall and you now have an elevator. I'm not sure that individual pods would be good (maybe make them more expensive) but for small groups going in the same general direction might be good. Actually I'm Canadian, but we also live in fairly low density cities, and the attitudes towards transit are fairly close to that of our American cousins. Canadians put up with it in the very large, high density cities like Toronto, Montreal and Vancouver simply because there are few alternatives (much of Montreal is bounded by an island, and Vancouver is stuck between the mountains and the sea), but bus ridership is generally confined to people who can to afford cars in other Canadian cities. If we're being realistic here, and not doing a retro-futuristic scenario where someone would be taking a diamagnetic train from Wye at the South Pole halfway across Trantor to work at one of Streeling University's student auto-cafeterias, how much workshould be optimally done by people in an actual on-site, F2F (non-telepresence, non-teleoperated) situation? People like dense walkable cities, especially now that the 1960s-1990s crime wave has faded, and dense walkable cities mean public transit. Subways and els and bus networks. And not conforming to a schedule, because the vehicles come every five minutes. And now I have this vision of Trantorian Heritage Rail. And railfans from all over the Empire coming to visit, just to ride the old whatever on the Tube. Rick, you've done this to me. I did not know about the Grand Central - Penn Station slidewalk proposal. I don't know whether the pratfall issue kept slidewalks from becoming more widespread, or just not enough demand for 'accelerated walking'. Probably no one really loves their daily commute, no matter how they take it! But in low density areas, where roads are uncongested and parking is cheap and plentiful, using a car is generally convenient. But even the relatively modest density of San Francisco is to make driving more of a hassle than taking the bus. Density is also the deal breaker for 'personal rapid transit' pods and robo cabs. They are very bulky relative to capacity, meaning they clog up in dense urban fabrics. Tangential to this, a curious thing I have noted in US car ads just in the last year or so: They frequently show urban backdrops, such as a city skyline. This is a striking change from the traditional open road settings for car ads. Apparently cities are now so fashionable that they feature in car ads, even though the city is not generally a fun place for driving. An interesting aside, Elon Musk is now speaking about looking for breakthrough technologies which will allow him to dig tunnels at speeds of 10X todays tunnelling machines and at significantly less cost. Like Hyperloop or some of the more outrageous SpaceX proposals, this is pretty much on the cutting edge of what is actually doable with current technology, but digging madly beneath the city and providing more veins and arteries for transit and transportation can certainly make a big dent in today's congested world. This also has obvious tie ins with Tesla and Hyperloop, Musks electric car company and high speed transport proposals respectively. An integrated system which picks up cargo from rail yards, sea ports or airports and slips into an electrified tunnel (where the vehicle draws on a third rail, for example) and delivers directly to an industrial park or shopping mall complex with no stops on the way seems to be a project with a huge upside (taking cargo traffic off the "streets" while utilizing self driving technologies (the "trucks" or trollies, depending on the technology used) and tapping into existing infrastructure only when necessary (the vehicle pops out of the restricted tunnel access and drives down the existing streets to the final destination, usually only a few blocks away). Scheduling pickup and delivery during the night or "off" hours reduces interaction with normal commuter traffic as well. Of course the other issue is dealing with the regulatory bloat and the perverse incentives that allow projects like simple subway line extensions to take years and cost hundreds of millions off dollars (or the "Big Dog" which was years late and billions of dollars over budget), which fast tunnelling machines are not going to fix. Forgot this question: how much workshould be optimally done by people in an actual on-site, F2F (non-telepresence, non-teleoperated) situation? That's a very big question, and at some point I'm gonna have to take on the subject of AI again. But tentatively, I think that people will want to continue to meet in person, whenever possible. So jobs where direct interpersonal involvement is central, not just incidental, will continue to favor on-site actual presence. It is a peculiar fact that the real cost of urban tunneling has risen steadily over the last century. I don't think it is simply 'regulatory bloat' or the like - Europeans generally do it more cheaply than in the US, for example. In part, standards are surely higher - we would not accept the inconvenience or mishaps that were taken for granted in 1917. With Elon Musk, focus on where he puts his own money. My impression is that he talks up a lot of fairly fluffy stuff, such as hyperloops, but gets much more serious and nuts & bolts oriented when he actually invests, such as Tesla and (obviously!) SpaceX. As traffic jams lessen due to automated vehicles (so I'm told), do you think urban authorities might try to cram more lanes onto a single roadspace? Or maybe less lanes due to less traffic? Or no change at all? It happened in Nottingham where I used to live some years ago. The council tried to make traffic flow more freely by increasing the number of lanes. Unfortunetly, working with a 19th century road system and making it even more cramped meant you were sweating about scraping the cars around you more than usual (especially if the car on the right was a police vehicle). Trantor is like a nightmare manifested to me. Sure with enough tech and fancyness it won't be a WH40K Hive City, but to me its still a fancier one. Ever read about Rat Utopia?? Its pretty much small-scale Trantor for rats. Doens't end well, the rats' s society cannot cope due to lack of available social niches. It collapses socially, mentally then phisically. If Rat Utopia happens with humans too, then Trantor is pretty much impossible. Some polemics say its already happening. IMHO, the only effecticve way to improve traffic in the long run is to significantly reduce the number of vehickles on the roads and the length of time they are on them. Self-driving vehicles ("automobiles," if you will) might create a temporary improvement until people get used to the increased efficiency, and then (as said) they will increase capacity- unintended consequences. As example: freeways are wonderful to quickly get to and from places, UNLESS EVERYBODY TRIES USING THEM AT THE SAME TIME. Sidenote after spending a few weeks in Vietnam: there, cars are outrageously overtaxed, so only taxis and rich people have one. Everyone else has a (small) bike. Even some taxis use bikes. The result is that despite rather rudimentary mass-transportation systems (they are only starting building metro lines), streets congestion is much lower than would be expected given how many people use personal vehicles. This is also helped by a relatively slow average speed and a rather liberal interpretation of traffic laws and maximum passengers/cargo per bike. So if we can have small, bike-sized or chair-sized pods, for example autonomous bikes or (don't laugh) automated Segways, this could seriously increase the local traffic capacity before congestion. Considering the need to manage the vertical aspect of transport, and a reasonable amount of planning in laying down the mass transport system, I see as promising a combination between elevators, subway and robo-cars. Imagine elevator-sized cabins, public property, running on rails and automated. They have only a small engine and no power batteries, they are powered by rails and as lightweight as possible. They have all standard sizes, and are fundamentally boxes. I see them similar to half-sized old-style train compartment, maybe sized for 4 people or about that. You call one of those cabins like you would call an elevator, or with an app, maybe even from your apartment door, and running automatically along vertical or horizontal rails, the pod would take you to your destination. The parking space would be limited to some properly sized local caches, and some big central maintenance services. The management of these cabins would be analogous to how we deal with data packets in a computer network: if you need long distance travel, they could be even automatically encapsulated in trains/convoys on long distance routes, with more powerful motors and aerodynamic envelopes to help with high speeds, and maybe these envelopes could contain common spaces like lavatories and feeding spaces, a bit like old-style compartment trains. Apart for that, of all the changed routes, momentary stops in queues and so on, the traveler would only see updates of his ETA on a display. I do not doubt very rich and powerful people would own private high-priority pods, and maybe different quality pods, and pods brands, could be part of a competitive market environment, like different air, train or taxi companies now. Public services could have non-standard pods with limited self-propelling capacities and/or higher-power motors to deal with emergencies. Sounds like the car taxes might be just right, not 'over'. Compare to the US with almost no congestion charges (plus subsidized parking) and growing congestion problems. As to streetcars, while they aren't all over, they're still very much alive in Europe. Public transportation in the US is a joke (though it's probably better on the coasts than here in flyover country). I use it here when I need to go downtown for jury duty (because parking in solidly urban areas is also a joke), and never for any other reason. It's a joke because typical US population densities just don't support a robust public transport network. Public transportation in Europe is really quite good. Busses aren't that much fun, but they'll do for getting to the local train station. Trains are awesome. On the whole, being able to get pretty much everywhere that I needed to go without a car was a wonderful experience. Even so, if our civilization had access to the stars, I'd be heading for the frontier, not for Trantor. I grew up in Chicago; its transit was decent in my experience, though I lived right by one of the El lines, the design is radial, and coming home from high school I'd have the fun of waiting 30 minutes for an ostensibly 5 minute bus, then 6 would come at once. Bunching gets bad on a 30 mile long bus line... Still, my family's car died when I was 7, and we didn't miss it much. Was better then than Boston's is now, I'd say. But otherwise, yeah, good transit needs density, and density has been outlawed in most of the country, even in the old cities where dense buildings from before zoning dominate. Someday, I would like to put in for writing an article in detail on when mass transit actually makes money. The density of a city planet is easy, of course; to me it's always been astonishing just how badly people have screwed up envisioning the ecumenopolis. Back in the good old days of the Star Wars expanded universe the problem of minimizing the conception of what one really was, was pretty painful. But in response to the commentators who think roads will change due to automated vehicles--not really in this century, if not even longer than that. Part of the problem is that robot cars will be effective enough at lowering fatalities that insurance rates for drivers of non-robot cars will actually go down. People who say they'll go up do not understand basic actuarial science. Yes, the rates will be higher for someone with their own vehicle -- but still lower than they are now, because in actuary terms, the risk of the driver who insists on their own car will be lower when most of the cars around them are robotic and therefore unlike to slam into them head-on due to drink driving. Likewise, as the death toll on the roads massively declines, the motivation to eliminate the last deaths by taking legal action against driving your own car will decrease as the issue becomes less important to society. So you'll reach a stasis point. It could be anywhere from 30% of the population still driving themselves (I doubt higher) to 3%; it could still be common or it could be about as rare as Amish carriages. It's very hard to say right now. But the roads will still need to accommodate driven automobiles, and motorcycles, and carriages, and bicyclists. And wide lanes help with things like creating safety separation between bicyclists and automobiles. Roads restricted to robotic cars will tend to be some select roads in cities chosen for arterial traffic--roads limited to things like bicycles and pedestrians would not be suitable for robotic cars, though robotic buses would probably circulate through them in special lines with passing arrangements -- and of course probably dedicated sections of interstate like the modern parallel high occupancy toll (HOT) lanes will be reserved for robotic cars. But these will be rare, and due to the cost of modern infrastructure projects, will comprise a distinct minority of even divided highways a century from now. What is going to be universal are electric cars, because economics will dictate the conversion as battery prices fall and oil prices increase, and current politics can only delay this for so long. The problem with contemporary streetcar projects in the US is not the technology itself, but that the projects tend to be decorative rather than practical - such as one way loops that don't really take you much of anywhere. Really interesting point that as traffic accident rates fall, the whole subject will get less public attention, so insurance rates will fall even for people who still 'hand drive'. Insurance might fall, but legal attitudes might change to view hand-driving as a reckless choice on your part, with zero tolerance for any trouble you cause. Also one putative benefit of fleets of autocars is safer higher density, for more throughput and less congestion; human drivers would mess with that, creating an incentive to ban them on freeways and arterials. Also, following the price = marginal cost rule of thumb, the marginal cost of an extra transit vehicle passenger is close to zero, until we get enough of them to approach congestion. Electric cars universal: I dunno. Batteries have improved but they're still a fair way from liquid fuel in both capacity and 'recharge' time (calculate the power rate of refilling your tank.) And they're unlikely to ever suffice for ships or planes, so even if all fossil fuel disappeared, we'd likely be synthesizing fuel for those uses, and for land uses far from a power grid. Could end up with a mix of hybrids and pure electrics. You can push the limits of train acceleration significantly beyond 0.2g with the use of ramps. I actually live next to a tram station on top of a viaduct where the trams take advantage of this. The vehicles accelerate very quickly (for a tram) and the ride is very smooth. I can imagine a Trantorian local train that has stops near the street level and the track 'swooping' down deep below street level between stops. A little bonus is that you get some nice regenerative breaking effects. Someone would need to do the math to figure out at what point the increased travel distance outweighs the increased acceleration. Also you'd need to consider that humans tolerate vertical acceleration better than horizontal acceleration. ...In the alpha-level concept, passenger-only pods are to be 7 ft 4 in (2.23 m) in diameter and projected to reach a top speed of 760 mph (1,220 km/h) to maintain aerodynamic efficiency; the design proposes passengers experience a maximum inertial acceleration of 0.5 g, about 2 or 3 times that of a commercial airliner on takeoff and landing. ...A trip would average 3,000 mph (4,800 km/h) and subject passengers to forces up to 1.4 times that of gravity, requiring the use of gimballed compartments. One question I have been thinking about asking with relation to city planets- are we talking level upon level of buildings? How are the foundations maintained? You absolutely cannot have the kind of set-up like in Star-Wars with the lowest levels of coruscant being uninhabited and forgotten about. If the foundations go that's it for an entire building. Of course we have examples of huge structures that last a long time and have been maintained over centuries- cathedrals for example. Many skyscraper will no doubt probably follow the same pattern. Furthermore, I've seen plenty of examples of buildings that have become dangerous to keep going and have to be demolished. Even if the vast majority of buildings could be kept up indefinitely, might there be examples of bad workmanship/ unexpected flaws in new designs that merit demolition? How might one do that on a huge multi-storey skyscraper? Safely taking it apart brick by brick might be possible, but I don't want to assume that. All I'm really trying to say is that I don't think people have properly thought through the engineering problems of such a planet. Its easy to do all these things when you have lots of free space and only a few storeys to contend with. I'm starting to think that the real issue is people are trying to create an "all in one" system which can accommodate people going from their front door to the door of there destination regardless of the distance. The only system on Earth capable of doing this is a personal motor vehicle (assuming there is a developed transport infrastructure for motor vehicles to use). However, public transit or mass transit is not designed not is it capable of doing so, and the only way to break the paradigm is to separate car ownership from car usage; essentially self driving cars called on demand like a taxi or Uber service. This would work to some extent on present day earth, since the vehicles will be amortized over a large number of users and they will be in service for a considerable portion of the day. The transportation infrastructure will also have some pressure taken off; self driving cars will not need suburban driveways, large parking lots at work or shopping malls and so on, but the amount of traffic on the roads will still remain similar to what it is now. If Elon Miusk's musings about tunnelling are correct, then there is the potential to take delivery service off the main roads. I could force electrically powered service vehicles, FedEX and post vans, delivery trucks of all kinds etc. running around a lambrynth of subterranean access ways and either stopping at freight elevators or surfacing at limited access ports to drive that last bit to the pickup or delivery site. Much traffic congestion is caused by delivery vehicles stopping on the roads (especially in heavily built up areas), so segregating traffic this way will certainly have a big impact on the speed and efficiency of transportation. Thucydides; I think your comments are thoughtful and well-presented. If we're talking about moving delivery vehicles off surface streets, why not ALL mechanically powered vehicles, and leave the surface to peds, bikes, etc.? Arterial routes could be both below and above city sections, with the surface even less cluttered. Yeah, the modern US seems incapable of building infrastructure -- even a big hole -- as economically as other developed nations. Unclear why, but it's pretty consistent. So what's cost-effective for civilized countries may not be so for us. 1. Public transit does not have to make money. In fact, in the US it has long been legislatively mandated that it can't make money, because the greater good was perceived to be affordable fares. And that's where we get government subsidoes. Everybody pays a little bit of every public transit fare, making the cash fare essentially a copay. 2. Public transportation doesn't enable walking cities. It killed them. Damien's Chicago is a good example. With trains and busses, people don't need to source everything through establishments and institutions all within 30 minutes walking distance. 3. Public transit in an ecumenopolis must necessarily be highly loval and otherwise highly inefficient. If half a billion people lived within an hour of a restaurant (for example) imagine what happens if it gets a good Yelp score. I was thinking recently about a population density of half a million per square mile. With a square grid city of acre lots isolated on x and y orientation grid by roads. Each of five hundred acres per square mile requires a twenty floor apartment. Each apartment is a single occupancy shipping container sized modular apartment with bed, toilet, laundry, shower, kitchenette. The inner core of the building would consist of caffeteria, ten floor vertical farm, pool, gym, tennis court, lecture hall, cinema, library, music auditorium, medical center. It would be necessary to house everyone who works at a particular location outside their own residence in the same building so their mass transit is an express service. "Public transportation doesn't enable walking cities. It killed them"
Manhattan is roughly 2x16 miles, well beyond end-to-end walkability in at least one direction. If you tell people Manhattan isn't walkable they will look at you like a crazy person. "it has long been legislatively mandated"
Can you cite the legislation? "Only if you make up your own definitions of [wlakable/walking city]. Yes, public transit means large cities you can't walk across in half an hour (assuming you could push through the crowds that fast), but that's not what people mean by walkable cities these days. They mean dense and pedestrian friendly neighborhoods that support lots of walking trips, ideally with good public transit between neighborhoods. Manhattan is roughly 2x16 miles, well beyond end-to-end walkability in at least one direction. If you tell people Manhattan isn't walkable they will look at you like a crazy person." The kind of dense neighborhoods you see in a lot of places are hardly full service. A lot of people have to take public transit to go to work, shop for more than immediate needs, etc. That doesn't exactly make a walkable world. In the old walking city, almost everything a person needed was in the neighborhood, from the butcher to the tailor to the undertaker. In a lot of cases, these neighborhoods clustered within walking distance of the industries that most of the people worked in. "(Though I've seen LA described as a bunch of walkable pods connected by cars; kind of true, compared to more uniformly sprawling places.)" I'd like to know who said or wrote that. I lived in LA for over 30 years and I don't know of many neighborhoods that are walking friendly. There are a lot of consolidated shopping districts and malls. But that came at the cost of local shopping districts that couldn't compete, due to the ease of access to the high density shopping with personal vehicles. People with the least of means, like non-driving teenagers and poor people, go to those places with public transportation because they have to, if they want to access the national chain stores that carry the wide variety of products that most people want. BUt if you live in or near one of those malls or districts you probably have to take a car or buss to go to the supermarket or drug store. "Can you cite the legislation [making public transit a non-money making enterprise]?" Not a specific piece of legislation. But certainly you're aware of the numerous city and county ordinances that regulate public transit fares? Those are a consequence of one of the premier social justice causes in the early 20th Century -- affordable train, streetcar, and bus fares. The fare that the average person could pay could not support a commercial transit system in most cases. So the fares were set for political and ideological purposes to what the average guy could pay, not what the trip cost. Government subsidies were and are used to make ends meet. That means that the cash fare at the vehicle door is really a copay on a trip that is otherwise charged to the taxpayer. Catching up, Pt 1 ... On using 'ramps' (or generally gradients) to speed up acceleration/deceleration, this is fairly common for subways, and some elevated 'subway' lines in NYC also do this, with express stations above the main track level, the express track rising into the station, then dropping back down. But while this allows higher acceleration for a given power, I don't think it increases the max aceleration suitable for people not strapped in. Catching up, Pt 2 ... Transit is obviously not walking, but experience shows that it meshes well with pedestrianism. For example, the rule of thumb among (at least US) developers is that people will not walk more than about 200 meters to their car. But transit planners have found that they will readily walk about 400 meters to an ordinary bus stop, and up to a km to reach excellent transit such as a rapid transit station with frequent service. And my own subjective experience is that driving a car somewhere to talk a walk feels vaguely unnatural, but when we lived in San Francisco it seemed not odd at all to take a bus and then walk. Transit becomes a sort of pedestrian's hyperspace jump. And, generally, 'walkability' is closely linked to density. At a suburban density of 5000 people per square mile (2000/km2), local shopping is inconveniently far for walking, while driving and parking are easy. At a 'townhouse' density of 10,000 per square mile (4000/km2), shopping is in walking distance, while driving and parking are a hassle. So that is roughly the density inflection point at which both walking and transit ridership become viable. On fares, the conceptual endpoint is elevators (the kind in buildings, not the space kind!). Most elevator rides are free, because otherwise no one would rent space in the building. Cities subsidize transit riders because affordable transit is necessary for the city to function effectively. What's next? asks Matter Beam. Well, the general buzz is that self-driving cars are next. We should start to find out fairly soon whether they really are, or whether devils will pour out of the details. Oh, you mean what's next HERE? And the answer turns out to be ... the battle of Jutland. "Cities subsidize transit riders because affordable transit is necessary for the city to function effectively." And cities (or countries) subsidize drivers as well, especially in the US. However, it is true that in most of the US, transit (in the form of buses) is more seen as a welfare/social safety net. Barely adequate (infrequent, radial) service, provided for the elderly and poor people, whose time is seen as less valuable or important. As opposed to an actual first class transportation system, or at least an important public utility. 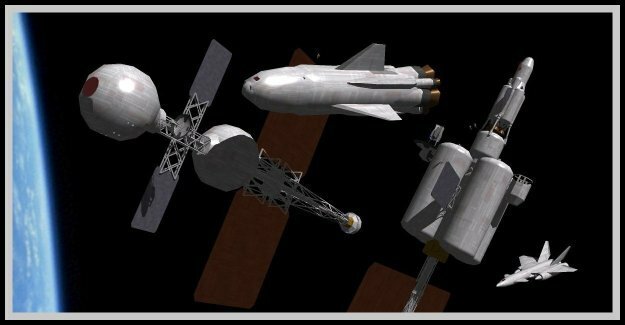 This video discusses 'Orbital Rings', which would be the best form of world wide rapid transit & the best way to move cargo & people between the planetary surface & space. Owning a automobile of your dream could be a reality lately. this can be thanks primarily to consumer loan that's created accessible to every and each aspirant desire to possess a automobile of his own Car Covers. I'm browsing to get trusted and affordable leasing a car agency in Lahore but it seems to be somewhat tough to find cost-effective automobile leasing service .